This project involved redesigning the user experience of Texts.com (the company has since been sold and the live site taken down). 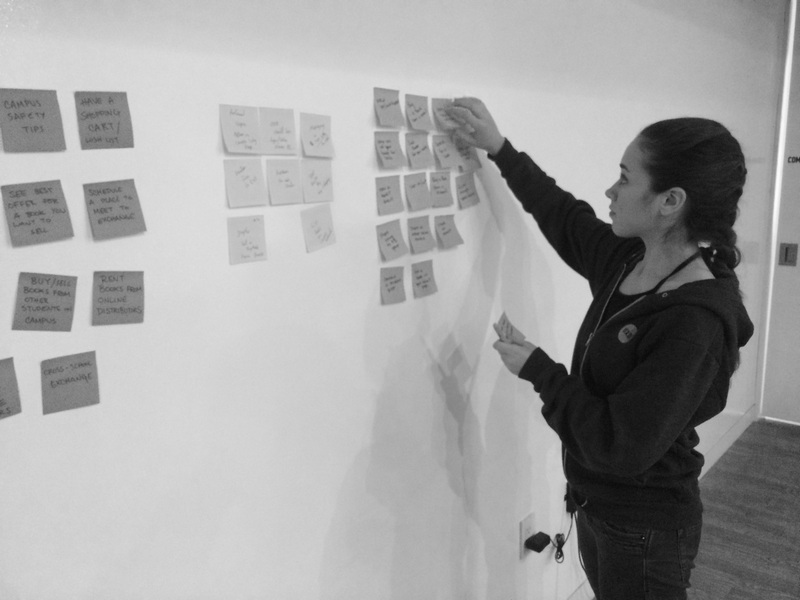 My team conducted usability tests of the (then) current version and developed a new Information Architecture, Content Strategy, and Interface Design for the site which was then passed on to Texts.com’s visual designer and developers. 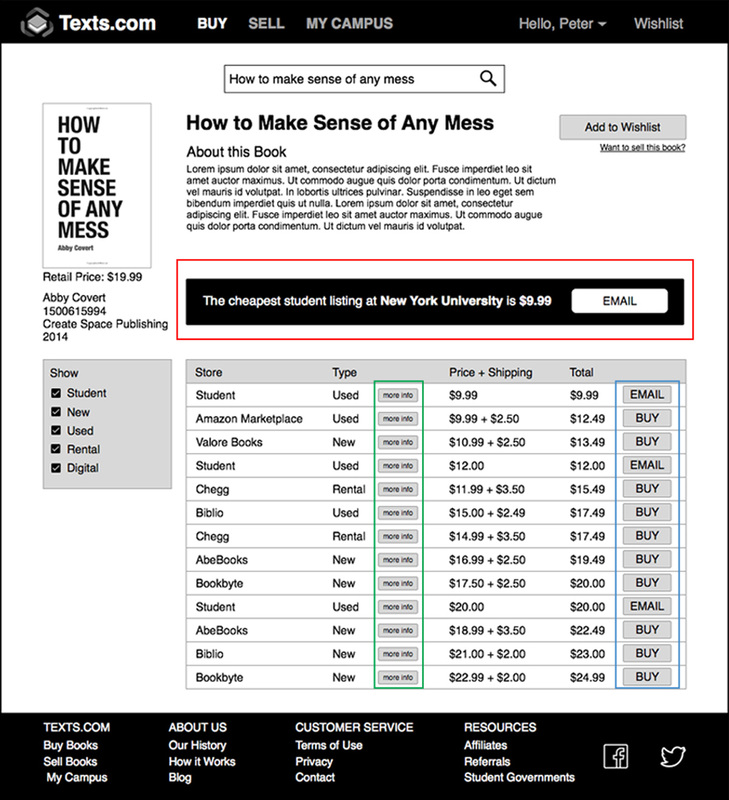 Texts.com facilitates textbook buying and selling between students on campus and between students and online vendors. Our UX team was brought on board after Texts.com was fully functional, but had not gone through any research or usability processes, so the first task was to understand the existing product. We conducted interviews with stakeholders also watched college students interact with Texts.com. These findings, partnered with takeaways from competitive market research, led our team to focus on restructuring Texts.com’s information architecture. 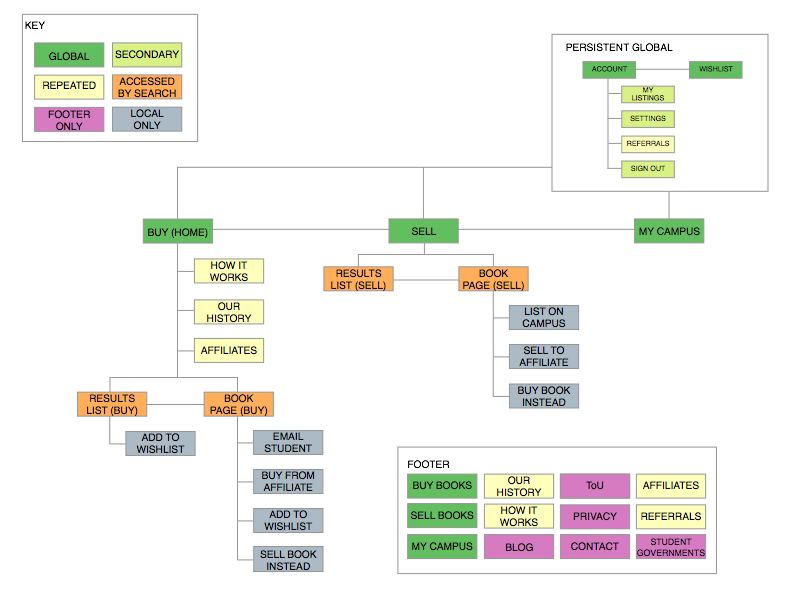 Part of this process was to visualize Texts.com’s current sitemap and user flows. The final proposals were informed by findings from testing the current site and analyses of competitive and comparative services. 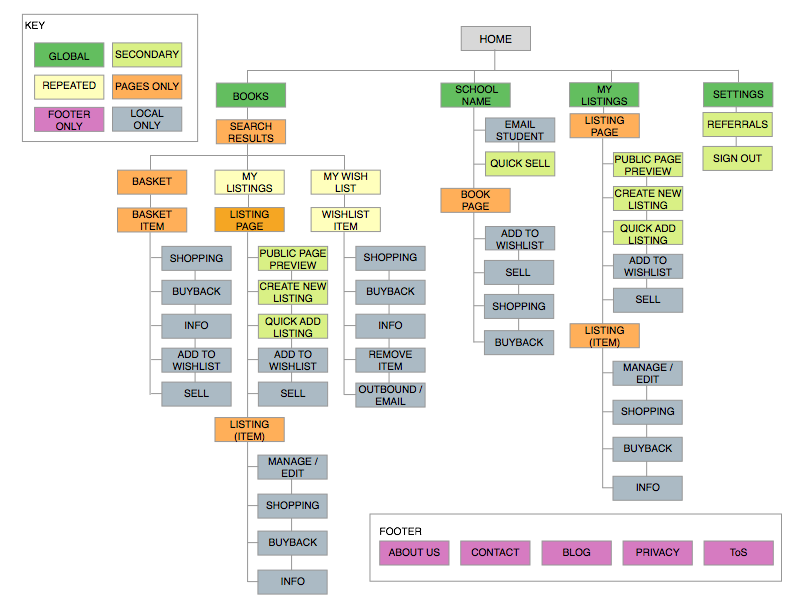 Below is Texts.com’s previous sitemap. Almost every action was accessible from every page which may sound convenient in theory, but actually confused users. They would get lost or frustrated within a flow and want to leave the site. The following is my team’s sitemap as of the end of this project. By splitting up the website’s main features (buying and selling) right from the primary navigation, users began to work through the site at a much quicker and more successful rate. The following is a diagram of Texts.com’s existing user flow for buying a book from another student. This flow was convoluted and even forced the user to search for the same book at two different points. Below is my team's proposed flow for buying a book from another student. 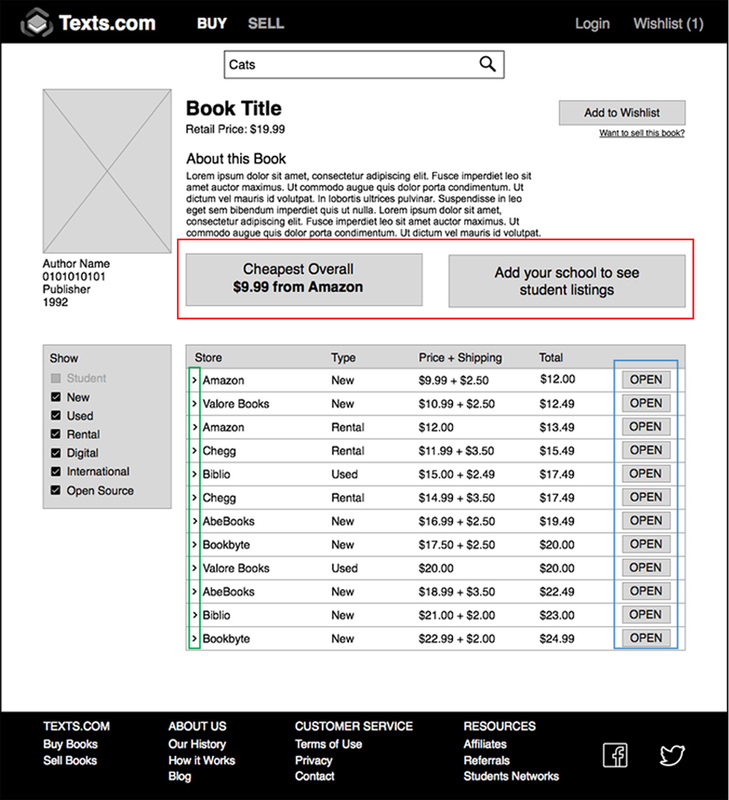 This flow enables a user (who isn’t signed in, at first) to go from searching for a book from the homepage to contacting a student who is selling the book in four (4) less steps than before. Once the group was comfortable with the new user flows and information architecture at a conceptual level, it was time to begin the wireframing process which would help reveal any holes and enable us to test whether our proposed structure would help students complete their goals on Texts.com. One of the more central pages on Texts.com is the product page for the textbooks, so my team made sure to focus heavily on this page. Before: Students didn't realize that they could login to see if any students were selling at their school (red). They also didn’t know that they could interact with the chevron icons (green) to reveal more information about a particular listing. Perhaps the biggest issue in this version was that student’s didn’t know what to expect when selecting “open” (blue). After: The split modules were made into one module that students no longer glanced over (red). The “more info” buttons made it clear to students that more information was available (green). Finally, more appropriate terminology replaced the vague “open” buttons (blue) that helped students understand what they were interacting with when clicking there.